... we crossed the square and first headed into the Sheikh Lotfollah Mosque opposite the palace, on the east side of the Square. Originally built as a private mosque for the ladies of the harem, the place wasn’t nearly as large as the others on the trip. What it lacked in size it made up for in coloring and the sheer exquisiteness of its painting and detail work. The inside of the central dome especially attracted photographers and raves from guidebooks and guides alike. Local, who’d probably showed the place 500 times, enjoyed explaining the ornate details of the work and the accolades it had received from around the Islamic world. 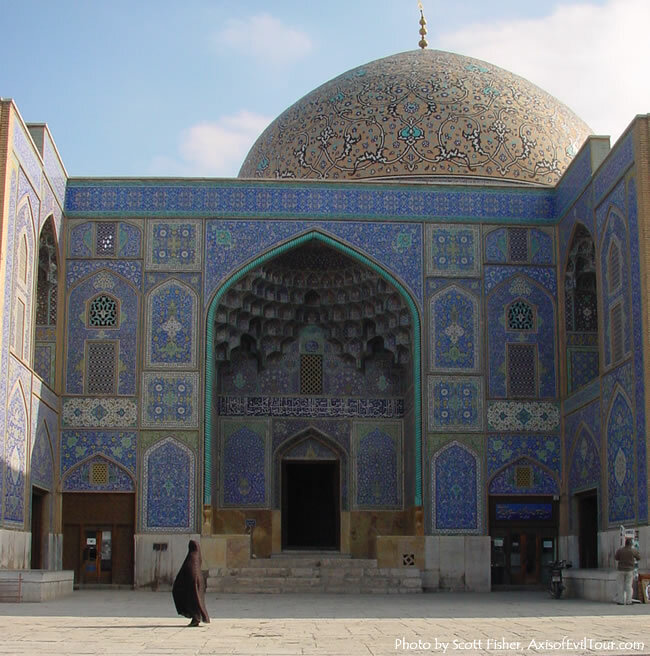 Tilting your head back and staring up at the colors and inlay of the mosaics above, said to be verses of the Koran written in a flowing cursive script, made it clear why Esfahan is saved for the end of the trip – mosques after the ones here just look dowdy and haphazard.